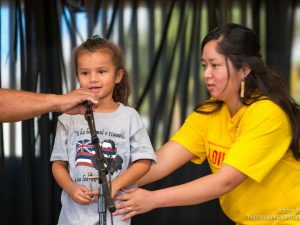 Throughout the ʻAha Aloha ʻŌlelo Event, sentiments of aloha for the Hawaiian language were shared amongst family, friends, and even through song from some of Hawaiʻi’s talented musicians. 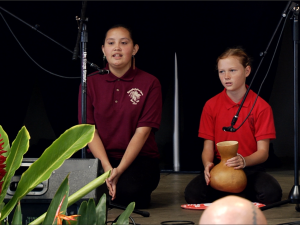 Enjoy this segment of mele Hawaiʻi performed at the ʻAha Aloha ʻŌlelo 2018. 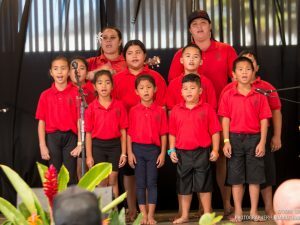 About ʻAha Aloha ʻŌlelo 2018ʻO “Ua Mau Ke Ea O Ka ʻĀina I Ka Pono” ka mākia o ka ʻAha Aloha ʻŌlelo 2018. Hoʻākāka ʻia ka manaʻo o ua ʻōlelo kaulana nei ma loko o nā māhele like ʻole o ka hoʻokūkū. Ua kūkala mua ʻia ua ʻōlelo nei e Ka Mōʻī Kamehameha III, Kauikeaouli, i mua o ke anaina nui ma ka Lā Hoʻihoʻi Ea ika lā 31 o Iulai, 1843. Ua lila ia ʻōlelo kuahaua a ka mōʻī i mākia lāhui no Ko Hawaiʻi Pae ʻāina a i ka mākia aloha nui ʻia e ka lāhui. E nana mai nō i nā hoʻokūkū hoʻopaʻanaʻau paukū nūpepa Hawaiʻi kahiko, nā hoʻokūkū haʻiʻōlelo, me nā hoʻokūkū hīmeni a oli i haku ʻia ma luna o nā manaʻo nūpepa Hawaiʻi kahiko e pili ana i ka mākia o nei ʻaha. Hoʻokaʻawale ʻia kēlā me kēia wikiō ma o nā pae makahiki kula, me kekahi wikiō no nā hoʻohanohano i nā mea lanakila, me kekahi no nā hui hīmeni o ia ʻaha. 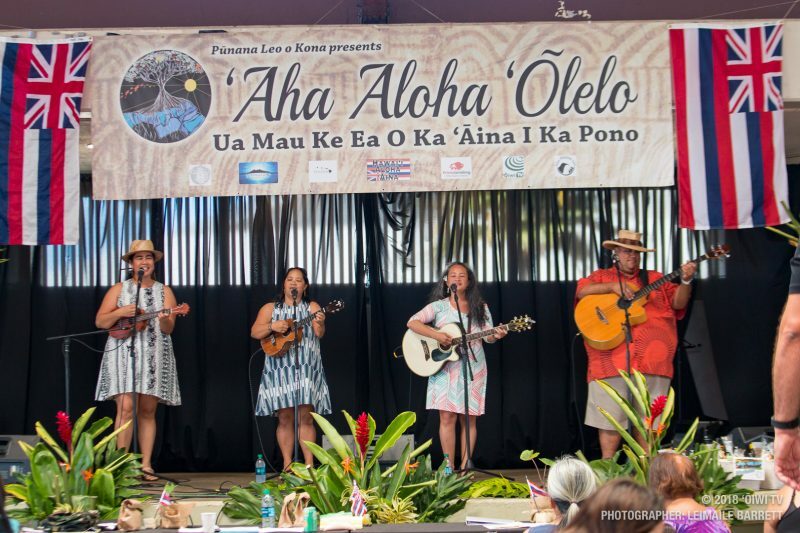 The theme of the ʻAha Aloha ʻŌlelo 2018 event is “Ua Mau Ke Ea O Ka ʻĀina I Ka Pono” brings to light different perspectives of the meaning of this phrase. This phrase was first proclaimed by King Kamehameha III, Kauikeaouli in front of a large crowd on Hawaiʻi Restoration Day on July 31st, 1843. The King’s proclamation became the national motto of the Hawaiian Kingdom, beloved and endeared by its people. 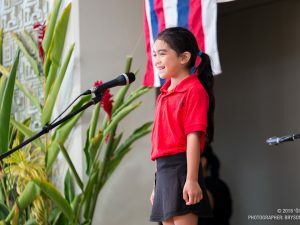 Enjoy in the various Hawaiian language competitions; memorization of Hawaiian news articles, original speeches, song and chant performances surround the event theme, “Ua Mau Ke Ea O Ka ʻĀina I Ka Pono”. Each video piece highlights a particular age group of competitors, a separate piece highlights the winners of each category and age group, and a separate video highlights the musical artists of that event.